Discomfort due to PMS , menopause , or less than optimal urinary tract function may be related to hormone changes and specific nutritional needs. The natural blend of antioxidant-rich fruits, herbs, vitamins and minerals in Vitolize Women’s Vitality Supplement is specifically designed with a woman’s needs in mind. Proprietary botanical blend including apple powder, passionflower and schisandra berry. Promotes hormone balance to help you feel yourself at all times. Patented, clinically proven cranberry powder. 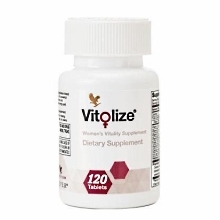 Vitolize Women's includes a proprietary blend of botanicals including apple powder, passionflower powder and schisandra berry powder, that has been used for centuries to balance hormones and support overall health and well-being. This blend is then combined with a clinically proven cranberry fruit powder that is made through a proprietary process that intensifies the natural benefits of the whole cranberry. This unique cranberry fruit powder incorporates a patented technology that protects the cranberry from destruction by gastric acid in the stomach, thereby delivering the nutrients to the lower gastrointestinal tract where they can be absorbed through a time-released mechanism. Vitolize Women's also includes a blend of nutrients specifically designed and balanced to support women’s health and hormone balance. Magnesium , vitamin C and the B vitamins are all essential for hormone production, yet these critical nutrients are easily depleted by stress and common medications including birth control and hormone replacement therapies. These vitamins have been combined with patented forms of iron and calcium , two critical minerals for women’s cardiovascular and bone health and have been properly balanced to provide complete support. Take 2 tablets Vitolize Women's twice daily as a dietary supplement.